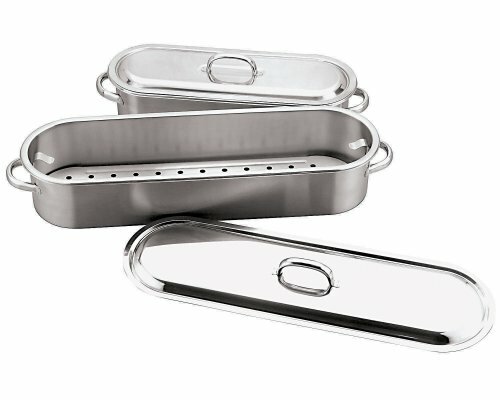 This 18 1/2 inch X 6 1/4 inch Paderno World Cuisine stainless steel fish poacher is part of the stainless steel series. It comes with stainless steel handles, a lid and a rack for support and removal of the fish. It is induction compatible. Gleaming, easy-care cookware, this collection is a brilliant demonstration of stainless steel in all its versatility. It responds to the requirements of the most demanding chefs and satisfies the strictest standards for hygiene. Ready to shine with outstanding ability, this cookware preserves all the natural flavor and quality of each ingredient.